Welcome to the first few days of summer! If going to the movies this summer is on your schedule, this week’s contest puzzle will test your knowledge of a well-known movie from the 1990s. I’m not much of a movie buff myself, but hopefully the theme entries in this one will help nudge me toward the meta solution. 17a. [Trendy lotion ingredient], SHEA BUTTER – it’s only a matter of time before someone pairs this with acai berries. 11d. [“The Man with the Golden Arm” subject], DRUG ABUSE – speaking of movies, this one dates back to 1955 and starred Frank Sinatra as a junkie. 33d. [Goes crosstown, maybe], TAKES A BUS – this entry feels a bit iffy as a standalone phrase to me. Is HIRES AN UBER next on this slippery slope? As I looked more closely at what the four “pinwheel” entries had in common, I noticed they all had an ABU sequence in them. Not only that, I then noticed a lot of other ABU’s in the shorter fill (which may have forced the unfamiliar to me UNOCAL and the USMC/USTA crossing which seems inelegant to me.) I vaguely recalled that ABU was the name of a monkey in either a TV series or in the movies–it turns out he is from the movie Aladdin, as hinted at by that central entry. OK, so if Aladdin is not the movie we’re looking for, what is? Well, it seemed appropriate as a next step to count the ABU occurrences and I came up with twelve. Hmmm, Twelve Monkeys, that sounds like the name of a movie, perhaps from the 1990s, and indeed it turned out to be. I’m not so sure how famous ABU is as a character, but Google will certainly help those who haven’t heard of him before. I put “A BUG’S LIFE” – with “ABU” hidden at the start. A bu-mmer, for sure. That’s pretty clever. Fabulous even. Thanks. It also worked with “CREATURE FEATURE” title, which is why I felt so confident about it! I too put in A Bug’s Life after seeing all the ABU since it fit with the title, even after seeing that ABU was in there 12 times. After seeing the real answer I would not have gotten it anyway. I have never seen Aladdin and even looking up in IMDB, it just shows that someone voices Abu, but it does not say it is a monkey. I dimly recall that A&R is “Artists and Repetoire”. Yes, the A&R (Artists and Repertoire) Department has traditionally been the most important division of a recording label – though changes in the way that music is distributed have significantly downgraded that unit’s importance. The A&R Department was specifically charged with finding, signing and developing new talent for a label. Think of them as the talent scouts for the recording industry. Not everyone knows A&R, but most of us are familiar with some of the legendary figures, and we’re all familiar with the artists that they selected and promoted. Simon Cowell is a modern day A&R guy, though a lot of his contemporaries are folks you probably haven’t heard of (e.g. Jeff Vaughn, Karen Kwak, Wendy Goldstein). Mitch Miller was an A&R giant at Columbia Records in the early 60s. Miller’s well known loathing for rock music shaped the artistic direction of his major label – he flat out refused to sign Buddy Holly, Elvis and The Beatles to Columbia Records. If you’re not already aware, very few “albums” are sold any more, and many new artists are ‘discovered’ by listeners on services like SoundCloud, Bandcamp and YouTube. The whole record label model that many of us are familiar with is fading – musicians create, upload and promote their music directly, without necessarily ‘singing on” with the type of label that would once siphon off a significant amount of the profits in exchange for its services. A&R divisions still exist, and they still promote, and make recording arrangements, but they’re not at all what they used to be. That was the most fun aha! moment I’ve had in months. 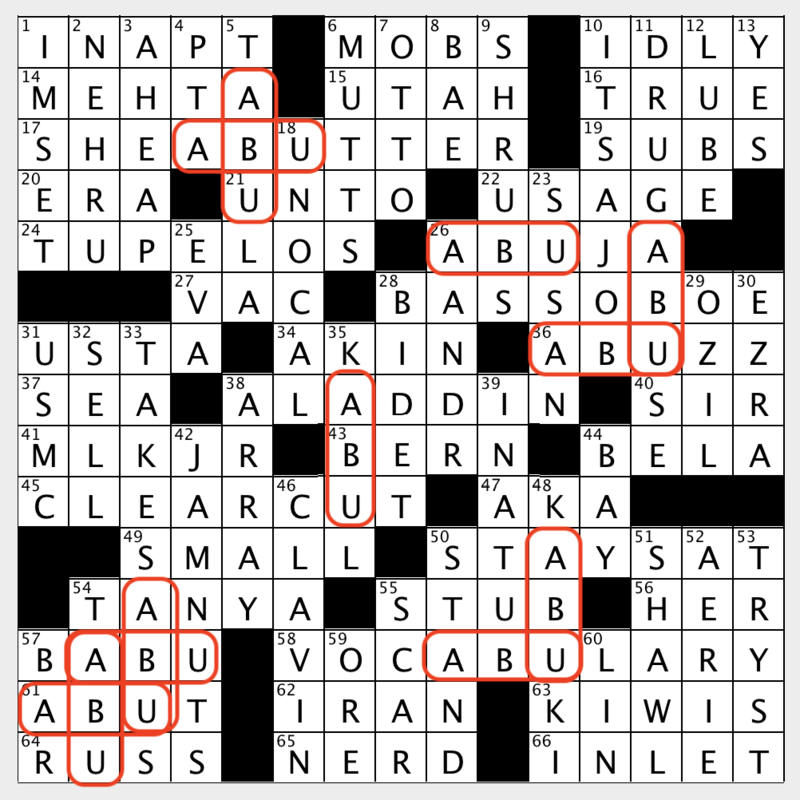 I saw all the instances of ABU, a bit confused by their unusual placement so worried if this wasn’t a false lead. I even Googled ABU without finding anything (other than diapers, the American Board of Urology, . . .), perhaps overlooking something obvious. Gave up. I didn’t know that ABU was a character in Aladdin, and I’ve never heard of Twelve Monkeys. Doesn’t seem common enough to me, and I don’t care much either for trivia quizzes or puzzles that depend on Google, but fine. My only real objection is that the fill was an awful slog. I do realize that so many instances of ABU were constraining. So maybe again I should just say fine. Call it a puzzle for others than I. I just hate to blame myself for not solving it. 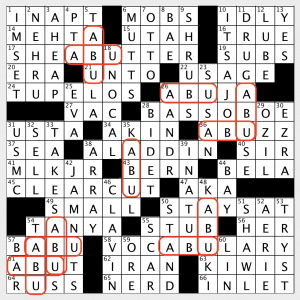 “___ Dhabi” beats it but the monkey has been the clue for ABU in the Times 15 times since 1998, so he’s officially puzzle-worthy. I submitted “The Return of Jafar,” aka Aladdin 2 after noticing ABU in all of the obvious theme entries. 12 Monkeys, starring Bruce Willis and Brad Pitt. A science fiction classic. I’m surprised to see this relatively low-rated; I thought this was a return to form for Gaffney (after some recent metas, hotly debated here, that I considered missteps). I happened to start with BERN and BELA, and the first longish entry I had was BASS OBOE, at which point I thought, “Man, is ‘Bee Movie’ from the 90s? And would anyone really want it in their puzzle?”. By the time I got to the end, I said, “OK, there really are a lot of Bs. Oh, huh, there are kind of a lot of BUs. Oh, huh, there are kind of a lot of ABUs… Oh, hah, there are twelve of them.” So for me, it was a perfect slowly-dawning discovery of the answer. Like Lance above, I think this was a return to form for Matt. Put me down as defending him on this puzzle to the naysayers. 1. Twelve Monkeys is a classic sci-fi movie (based on the classic short “La Jetée”), not some obscure movie. 2. Googling ABU with “creature” or “feature” – the 2 words in the title – would bring up Aladdin and that Abu was the monkey in it. Until I saw A-B-U, I thought it was just B-U and that there were about of BUs about. I thought maybe this was a phonetic spelling of BOO and that they were hinted at Booing of ghosts. or “Ghost” the 1990 film. But I knew that Matt would have actually used B-O-O instead for that route. Then I noticed the A’s. I also love how the title of “Creature Feature” doesn’t give away the genre of the movie since “12 Monkeys” isn’t really a creature or monster movie but monkeys are a creature. Well done, Matt! Fun fact: 12 Monkeys features the actor Ernest ABUba. Did anybody else think the meta answer was “BUtterfield 8”? The letters BU appear 8 times. Telephone numbers back in the day were expressed as words and numbers. I knew that the movie came out in the sixties, not the 90s, but I was so sure of my answer that I thought the clue had a typo.